Take I-95 south to I-495 north to I-66 west: Follow I-66 west to Virginia Exit 44 which is Route 234S (Bypass), approximately 12 miles:( Follow the Fairgrounds Complex Sign): Follow Route 234S to Business 234/Dumfries Rd. and move to the far left lane. Turn left: proceed approximately one mile to the Fair Grounds, entrance is on the left. Take I-95 north to Virginia Route 234 North, (Dumfries Road) Exit 152; follow Virginia Route 234 approximately 14 miles to Business Route 234/Dumfries Rd., turn right; proceed approximately one mile to the Fair Grounds, entrance is on the left. Take I-270 South and then I-495 to Virginia, exit at I-66 West; follow I-66 West to Exit 44 which is Route 234S (Bypass), go approximately 12 miles:(Follow the Fairgrounds Complex Sign) and Route 234S to Business 234/Dumfries Rd. and move to the far left lane; Turn left: proceed approximately one mile to the Fair Grounds, entrance on the left. The show will be held at the Prince William County Fairgrounds where the parking is free and ample. The show has been featured several times in the “Washington Post” and the “News & Messenger” as a "best bet" for the weekend. Attendance has grown steadily and visitors come from both near and far to help us celebrate the love of quilting. As usual, we plan to exhibit quilted work from both the Cabin Branch and Stone House Guilds and offer free demonstration classes for you. Our guild boutiques and Silent Auction will exhibit items to purchase while our community service table will show you how we reach out to support our community organizations. You will have the opportunity to support some of our community organizations by buying raffle tickets to our two lovely raffle quilts. There will be a scavenger hunt for the kids, and you can vote for Viewer's Choice awards. 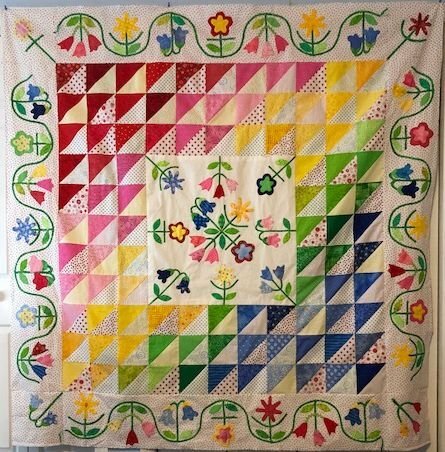 In addition, our loyal vendors at the show will have a fine selection of fabrics and other quilting related items to tempt you. If you love quilting as much as we do, please spend a day or two with us. We promise you our very best efforts to make your time well spent.